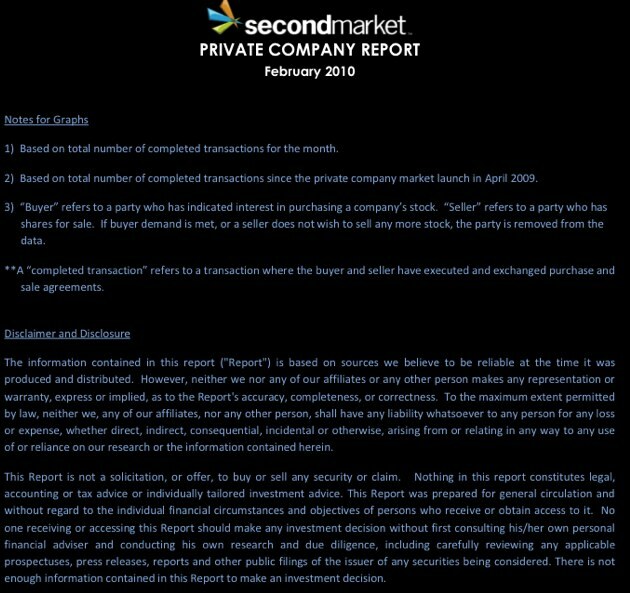 Last month SecondMarket published data on private company stock sales that they helped complete in 2009. They’ve now released last month’s data as well. A total of a little more than $13 million in sales occurred, with the average transaction size of around $2 million. There continues to be very strong demand for consumer products and services startups (which includes companies like Facebook, Twitter, LinkedIn, Digg, etc.). 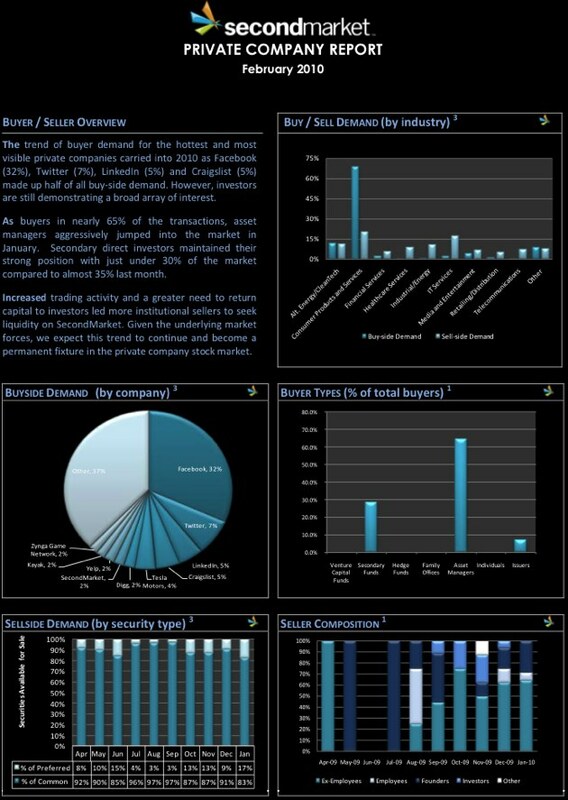 But the sellers are spread out more evenly across all categories, particularly consumer, IT, Healthcare, energy and cleantech. 36% of the transactions were sales of Facebook stock, and we’ve heard from independent sources that sales are being completed for as high as $40 per share (or a $17.6 billion valuation). That’s a substantial price increase from less than a month ago. 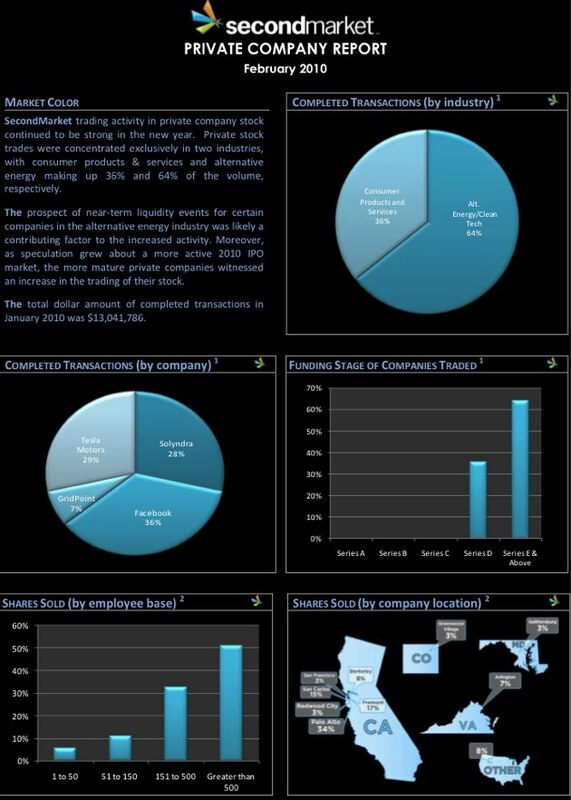 Tesla took 29% of the transactions, and sales of Solyndra stock were 28% of the total. Gridpoint rounded the group out with 7% of the total. The complete report is below, and you can download the pdf here.